Having last week announced a special one-off UK concert performing with Adam Lambert at the Sonisphere Festival, Knebworth on July 7, legendary rock band Queen has announced it will play an additional earlier date with the singer when Queen and Lambert appear at Moscow’s Olympic Arena on June 30th. 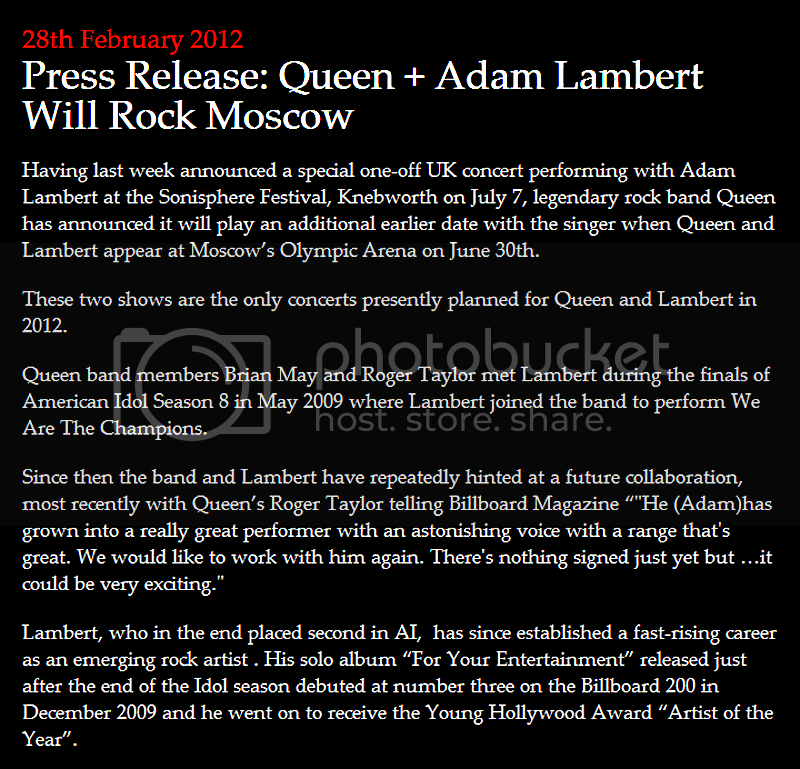 These two shows are the only concerts presently planned for Queen and Lambert in 2012. 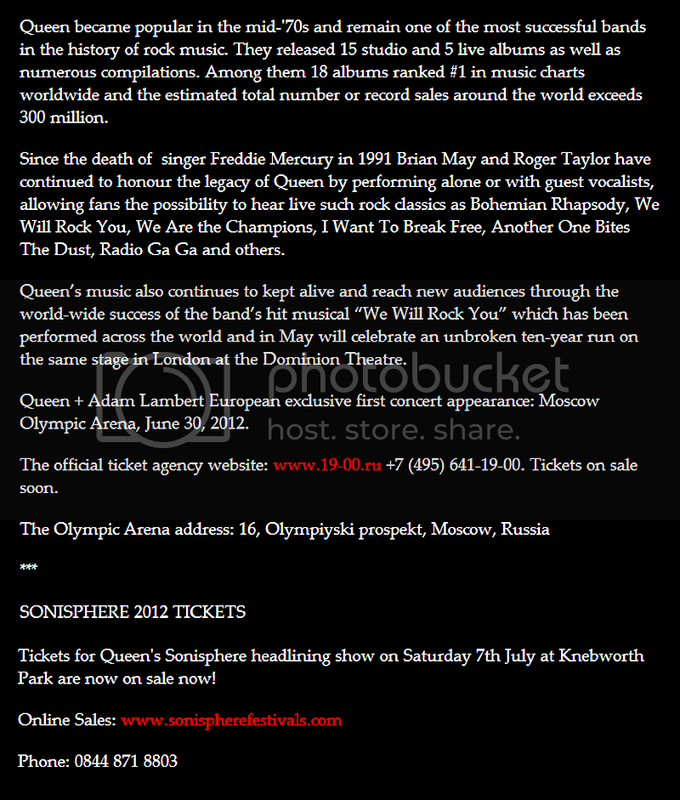 Description:June 30 legendary group Queen will give only an exclusive concert in SC "Olympic". After the rock group announced together with the performance of Adam Lambert in the UK on July 7 Festival «Sonisphere Festival», it also announced an additional, earlier, a concert in Moscow in SC "Olympic", where the Queen will perform with the same front man. These two concerts at the Queen Adam Lambert will be the only ones in 2012. Friends, as soon as information about the date of receipt of ticket sales, we will notify you. 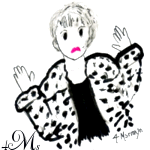 Does anyone know how to get a ticket if you do not live in Moscow? Xenia, the same question. is it possible to order online? DJ: And now a few words on the subject of our program, which focuses on the group Queen. So, after the death of Mercury in some concerts and recordings George Michael, Robbie Williams and a group of Five were soloists. However, the most successful collaboration was with British blues-rock musician Paul Rogers. Their project was called Queen + Paul Rodgers: Return of the Champions. And many of our listeners certainly watched that concert in Moscow on 15-16 September 2008. 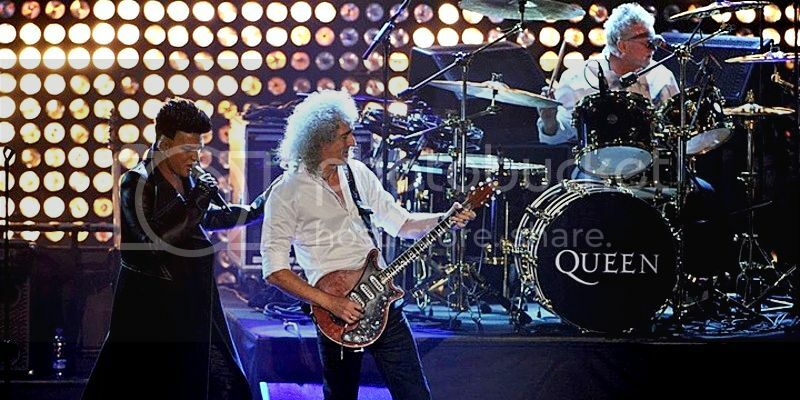 And finally, Queen back in Moscow, but this time with Adam Lambert. DJ: Ildar, tell me, please, a few words about this show, why their choice fell on Adam Lambert and whether you have watch a joint project, a few words about this show. Bakeev: Yes, it's a very good luck, because we are friends with the management of Queen.We have known since the days of working together to create a rock opera We Will Rock You in Moscow. And a very good person and a great expert, Jim Beach offered us to do in Moscow, an exclusive concert. The first concert. DJ:: So it was not anywhere else? Bakeev: No, no. This will be an exclusive (special) concert. Let me explain why. Because they have conceived a certain program for a concert nearby London, where Freddie Mercury had the last concert. And then raised, I think, three hundred thousand spectators. Bakeev: our group VKontakte. Fans asked him very hard. You know, in Moscow, such a strong, enlightened audience that people know the great names: they hear them, they somehow pass them to each other. And so thanks to the Internet and social networks the guys are on the front row in the information field. And when there was a possibility, of course, they asked Adam Lambert. We tried to do a concert last year, but we did not succeed because he was at the festival in Moscow, which took place in Tushino, and it was a great success. And when John Beach said that the concert will be Adam Lambert, I gasped in surprise, because I was waiting for a name - who will be/ Because, to tell the truth I did not like Paul Rodgers in Moscow very much. Well this is my personal opinion. DJ: Yes, we will not interfere. Bakeev: I love Paul Rodgers from childhood but separately from Queen. Free and Bad Company - my favorite band. And I's waiting for this exciting concert, and it was an interesting show. But it seemed to me that they are so strong that they pulled in different directions. Queen is one thing. Paul Rodgers - another. Bakeev: Some successful discoveries they have been, but it was dissonance often. 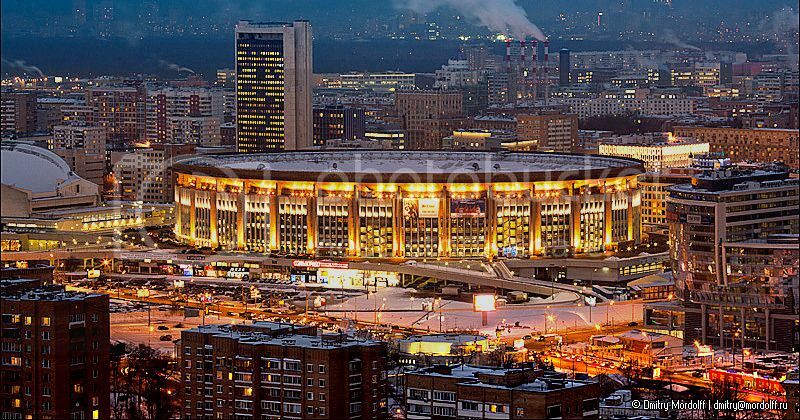 But still it was a great victory for Russia, that the concert was held and it was even two performances. I have seen how the public took them. But Adam Lambert - this is an exception. Bakeev: First of all, he is young. DJ: How old is he? Bakeev: I've seen clips of his participation. I saw Queen & Adam collaboration on EMA. This is a man very close to Freddie. He inwardly, internally very close to Freddie. He is also a great expert, and he has the same sexual orientation. And he does not hide and I think that's a plus, because it is a kind of disinhibition, very nervous, deep penetration into the material. And yet, I really like that he keeps his distance. It just shows that he is not going to copy Freddie. That's what I like. He is very respectful for the musical material, and Adam shows sometimes that he can easely sing as Freddy technically. But he re-reads and displays his own attitude. In this sense, I’m looking forward to this concert eagerly, because I think it would be very cool. Especially because we all know that Queen are a perfectionists. Each unit is approved, each lamp is adopted. They are going to do a serious show. They said: "All that will be not find in Russia, will be bringing with them abroad" And etc. So we are waiting for a big concert for 26 thousand spectators. This will be a dance concert. There will be a big fan zone, a large dance floor, will be VIPzone as well. This will be on Olympic Arena. DJ: Are tickets on sale now? Bakeev: No, tickets will be available soon. I think that will be on 5 or 9 March. Because we have the official sale of tickets for Madonna's concert on March 1. And Sting in the official Olympic ticket sales will start on March 7. I'll try to get between them. It so happened that we now have loads simultaneously three major projects that are one by one. But I could not refuse from any of them. Bakeev: I say hot, but bit his tongue. God forbid! Bakeev: Well, look, it's still the Olympic, good condition, air conditioners, bufety. Queen and Adam Lambert are going to be very good. And I repeat, we will be first, and it will be an exclusive concert - one in Moscow and one in KNEBWORTH. DJ: And an exclusive interview Eldar Bakeev on our radio. Bakeev: We will try to bring Adam Lambert to you in the studio. Of course, I can not promise. DJ: It would be great! Bakeev: I'll try. I will tell you a secret that we are planning to bring Brian May and Roger Taylor here specifically to talk to the press: a radio broadcast journalists, TV. Bakeev: We will try to organize, if we get lucky. And then they will tell everything themselves. But it's all ahead. And now let us listen to a song. don't know how much was told about tickets, I talked to people when I was buying and was told that they put tickets on sale lot by lot (is it understandable? ), so you can buy good (even better than now) tickets later. My friend and I decided that we'll try to buy closer tickets later, but for now we have! these, not very bad - 3d row in a VIP section, it's not a central section, one to the side, still should be pretty close. Don't know how far from the stage, but I was told that it's higher than fan-zone or dance floor. It cost us about 200$ each. Central VIP sections and sections behind VIP are more expensive. Queen fan zone is quite pricey as well, more than 300$, but I know some ruGlamberts will be there, so we can wait for close-up pics and vids (hope).